Fact or Fiction is back in 2019! In this feature, we will tackle some of the pressing questions in Broward with HSBN Co-Founder Anthony Uttariello and Editor-in-Chief Rick Duteau. We also are please to unveil our new Team Stat pages. These stat pages can be found in the stat tab dropdown. All stat categories are clickable, so see where your favorite team stacks up against the rest of the county! Enjoy! 1. Northeast is on pace to hit over .400, and score more than 300 runs. Both will happen. Anthony: Fiction. I wrestled with this one for a while, but I have to go with sheer numbers and laws of averages here. Currently, the Hurricanes sit at .406. If they can get through their next five games, and are still hitting over .400, then I would say they have a shot. But, their next two games are against teams with a combined 10-1 record. After that, they get a hungry Archbishop McCarthy team looking to turn their season around, and a team in South Plantation that has won four straight. My guess is they finish the year somewhere around .385, which should still be enough to take home the team average crown. Rick: Fact. Does a one-legged duck swim a circle in a pond? The Hurricanes are getting the job done at the plate, and the lineup is proving to be very deep. Sophomore Robert Zuany is becoming comfortable at the plate in his second varsity season, leading the club with a .611 batting average. Nick Donatucci is batting an even .500 and has five extra-base hits, and Manny Carela, Logan Rose, and Nick Steinberg are all producing. Meanwhile, Ryne Guida has barely gotten going, but has slugged .889 in only nine at bats. Almost every guy on the team has already scored at least a few runs, and the club already has 17 stolen bases too. Northeast is getting guys on and getting them in, and that is not going to change. 2. Taravella has started strong under new Manager Joe Giummule. The Trojans will wrestle the district title away from Douglas this season. Anthony: Fiction. While I believe that in his first few months on the job, Giummule has reset the culture at Taravella, this is still a district that Douglas has dominated. Outside of a few years when the Marlins’ Lewis Brinson was leading Coral Springs, the Eagles have been the clear favorites every year. Manager Todd Fitz-gerald has mentioned that this may be his most talented team ever at Douglas. That comes from a coach who won a state title with an Eagles team a few years ago. The top seed in the district plays big this season, as both Monarch and Deerfield have arms that could upset either Taravella or Douglas in a first round match-up. What people forget when assessing possible upsets, however, is that teams like Douglas and Taravella also have aces at the top of their rotations. I am expecting Taravella to close the gap between themselves and Douglas, and continue to do so as Giummule gets his system in place over the next few years. I am just not sold that this is the year they topple the six-time district champs. Undoubtedly, Giummule will have some tricks up his sleeve come playoff time, maybe warming up three pitchers before the game, or parking the bus in a lot down the street from where districts are being held. But eventually the mind games will all come down to the players on the field, and I still think Douglas holds on to their title. Rick: Fiction. Certainly Taravella has the players to wrestle the Eagles’ stranglehold on the district title, which Douglas has won the last six years. But that sort of dominance has rightfully earned Douglas the recognition as the clear favorite, and the current group is as experienced and as talented as any. The current format changes the priority, as the most important game in the district tournament is the district semifinal. Should the current standings hold up, these two teams would be the top two seeds, which would likely mean both sides would start their top pitcher for that semifinal game. Should that starter run into trouble, the number two guy should be the next on the hill. Sometimes this does not leave much in the barn for the title game, but Coach Giummule knows that getting into the regional playoffs supersedes all else along the way. If you are a fan of both teams you can only hope that they both make it to the regional semifinal, which would have to mean that the two clubs would be meeting for the fourth and final time this season. It would all come down to that do-or-die moment, and those are what baseball fans like myself live for. 3. A Broward team that has never made a run before will make a run to states. Rick: Fact. The Sagemont Lions were very close last season and the team returns as strong as ever, off to a 5-1 start this year. The Lions are already 3-0 in the district and could potentially have the top seed in the district locked up shortly after April Fools Day. The largest hurdle in the way is the John Carroll Rams, who won the regional title last season and have returned just as strong in 2019. The most promising sign so far is the discipline Sagemont is showing at the plate, with a team on base percentage just under .500%. The team is well-coached and focused on making program history, and this team is heading to Fort Myers this May. Anthony: Fact. I am with Rick on this one. Sagemont has been eerily close to advancing to states over the past decade, and this is the team that I believe gets it done. 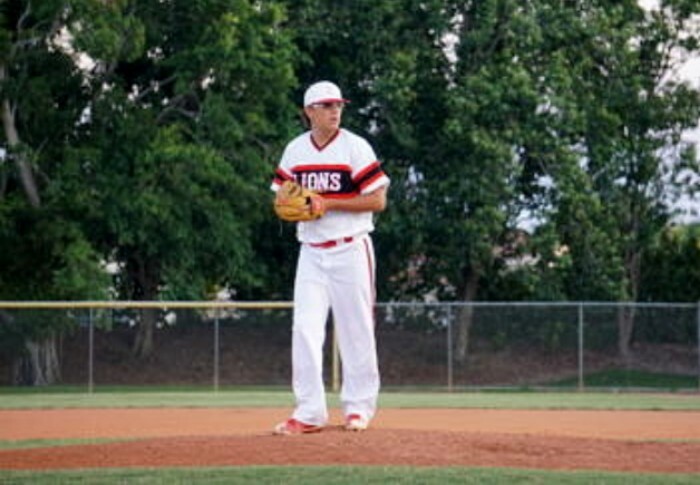 The Lions have a balanced attack, and are strong on the mound. They also return many players that were on the field in last year’s regional finals loss to Archbishop Carroll. Sagemont does not appear to have anyone in their district to contend with, and should be able to cruise to a regular season district title. From there, the depth of these small school teams will be tested in the two game regional playoff week. Carroll, Jupiter Christian, and Berean Christian are all formidable opponents, but I like Sagemont to break through and head to Fort Myers this season. Two other dark horse teams to keep an eye on are McArthur and Cardinal Gibbons. The Cheifs have more than enough pitching to advance to states, and the Mustangs have been one of the brightest surprises early in 2019. 4. 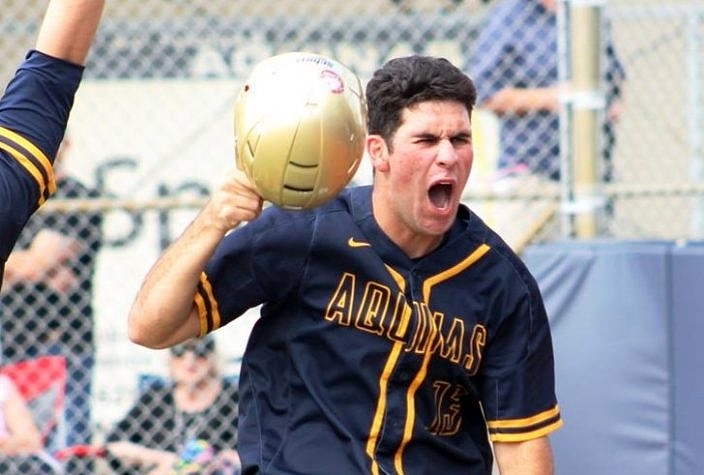 St. Thomas Aquinas currently leads all teams in the county with 75 total strikeouts. The Raiders will keep pitching like this all season and lead Broward County in strikeouts. Anthony: Fiction. Of all these questions, this is the one I am most wary of my answer. While there is no doubt the Raiders have one of the top staffs in the county, I see some of the teams behind them making a push for the strikeout title. Most notably, Calvary Christian, Douglas, and Nova. All three teams are within 15 strikeouts of St. Thomas. The schedule says that the Raiders will have some tough offenses to contend with through the second half. The other three teams have varying strength of schedules, but I think in the end Nova has the best shot to rack up big strikeout totals, and will emerge as the leader in the regular season. Having said all that, it wouldn’t surprise me in the least to see the defending state champs hold on to their lead. Rick: Fact. Typically to accomplish something like this, you must start by having at least one workhorse leading the way. 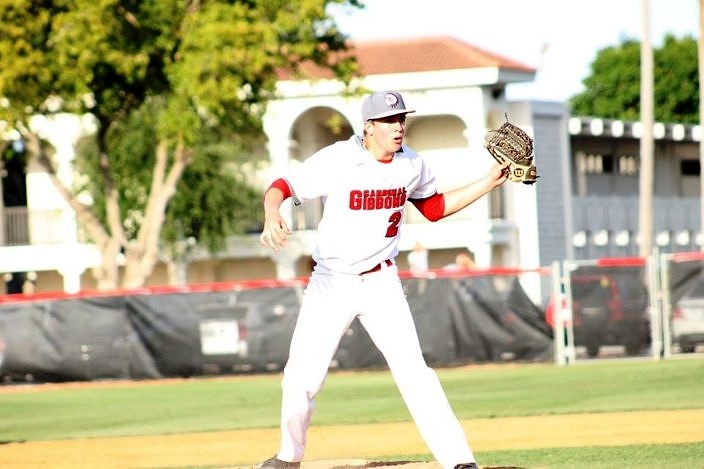 Currently, senior Isaiah Hood is tied in second place in Broward with 28 strikeouts in less than 13 innings. The Raiders have a deep stable of hurlers behind him that are all contributing. In regards to their depth, it adds even greater chances of their ability to strike batters out, as they can constantly go to the bullpen and bring in new looks with varying deliveries and velocities. Nate Thomas and Blake Purnell both figure to also get a lot of work, but it is a wide-open opportunity from there currently being split between another ten guys. This friendly competition should only add to the production, and the Raiders could send a lot of guys sulking back to the dugout this year. 5. Coral Springs Charter and Cardinal Gibbons are the lone undefeated teams in 5A-14. A team other than those two will win the district crown. Anthony: Fiction. While there are some dangerous arms to contend with in 5A-14, I think this may be Gibbons’ year. The Chiefs have the deepest pitching staff in the district, and that plays well in the district tournament. Coral Springs Charter has been a pleasant surprise under first year Manager Charlie Fine, and they will be tested this week in the HSBN March Madness spring break tournament. If the Panthers can win or perform well in the tournament, their stock will rise in the district, and teams will start taking them for real. Below those two, Brian Campbell always has his teams ready come district time, and Somerset has some arms that could make things interesting. Pompano and Pine Crest will have to improve on their early season start if they want to move into the conversation for district champion. Rick: Who Knows. Betting on who will win this district is like turning on the garbage disposal and sticking your hand down there and betting on which finger you will still have when you pull your hand back. I want to take a stab at this question about as much as I want to get a haircut while riding in a roller coaster, but all right. I think Cardinal Gibbons has been very close over the past few seasons with a lot of younger guys that have now grown up, and this could be their season to grab the district title. The Chiefs are strong in all the right places and have the greatest asset in the world in that they are hungry and determined. Ever since this group of tough teams all came together in this district, there have been upsets every season in the district tournament. Cardinal Gibbons looks to be the team at the top this year, and I expect the Chiefs to earn the number one seed and take the regular-season crown.